City Hall romance image by the 3rd Floor window - Angela and Michael's City Hall Wedding Gallery - Downtown Reception. Sometimes a romantic pose of the bride and groom can accomplish more than one single aspect of the job at hand. In this case, we wanted to show a more romantic side of the newlyweds, but also realized that we had not captured too many photos of the back of the dress. One of the challenges of showing the back of the dress is that you also are showing the back of the bride! Not that this is a bad thing, but it definitely helps to create a pose that looks natural while displaying this beautiful part of the wedding dress. 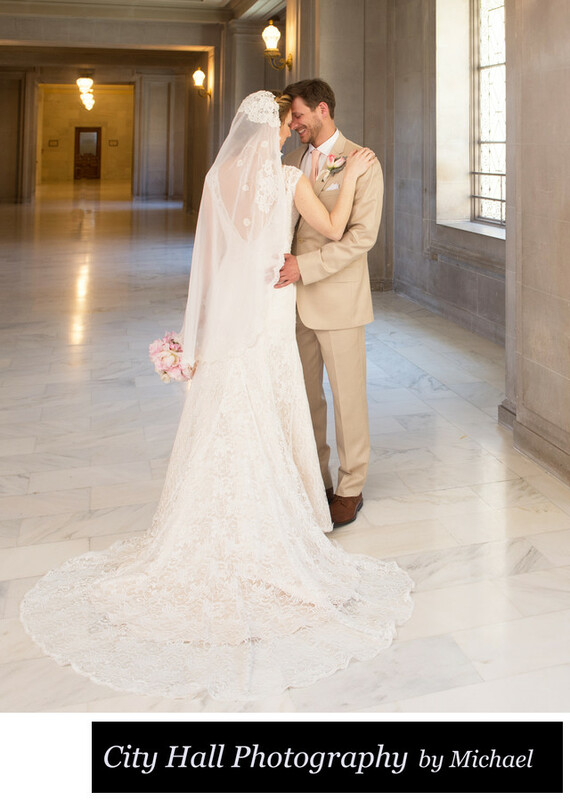 For this San Francisco city hall wedding shoot, we had lots of opportunities to do just that. The couple booked us for one of our larger packages so we were able to give them a very nice variety of photographic selections including the one above.